In previous articles, we at the Buy Owner Blog have given you several ideas for eco-friendly improvements. Specifically for your kitchen, we’ve offered tips for everything from how to choose new appliances to how to select materials for flooring, windows, cabinetry and lighting. In this post, we’re getting even more specific, focusing on an aspect of your kitchen you really couldn’t do without: the sink. Here’s what you may not know about sinks: not only are they a necessary part of a functional cooking space, but they also can be a great way to go green, particularly if you choose well in the type of material they’re constructed from. Eco-friendly sink materials include stainless steel and cast iron, both of which are recyclable and sometimes available used at salvage yards. As an added bonus, stainless steel is very easy to find and in a variety of sizes; plus, it’s easy to clean! Sometimes it’s possible to extend the same material from the countertops to the sink, creating a seamless transition of work space and minimizing bacteria-harboring crevices. Because they are easier to clean, under-mounted sinks may be preferable to surface-mounted ones, despite being more difficult to install. Just note that the material you’ve chosen for your counters may limit the type of sink you’re able to pick—for an under-mounted sink, it’s best to choose concrete, stone or some other solid-surface counter. •	Your kitchen is also a great place to add a water filtration system, which we’ve written about in a previous Buy Owner Blog article here. •	A foot pedal makes you more aware of how much water you’re actually using, and it doesn’t allow you to walk away with the water still running. 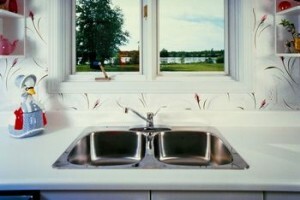 •	Change the faucet to one that is low flowing, and save on energy. Lower water bills aren’t just good for you and the environment; they’re attractive to buyers!